How to fight a situation that seems farcical? When reality reaches absurdity, the subversive power of laughter steps in. Laughter is never innocent, it happens to us, at times inappropriately and inauspiciously. Psychoanalysis is well known for having shed some light on the perennial mysteries of what we do not control – dreams, parapraxes, symptoms, and sexual problems. While the Freudian slip and the bungled act have become part of Western culture’s lingua franca, it is less commonly known that psychoanalysis provides revelatory insights about the mechanisms of jokes, comedy, humor and their effects. Many people today would happily admit to their Oedipus Complex, but few would feel comfortable reflecting on why they laugh at the humiliation of their co-worker, titter at an ethnic or sexist remark, or realize that like jokes, their dreams are made out of puns, witticisms and one-liners. Few note, as Freud did, that dreams were “insufferably witty,” revealing an annoying predilection for bad puns. And fewer have noted, as Lacan did, that comedy allows privileged access to the unconscious. We propose a paradigm swerve, a Freudian slip on a banana peel. If psychoanalysis has long been associated with tragedy, there is a strong warrant to take up comedy as a more prescient productive model. Jokes and the comic have not received as much consideration as they deserve, given the fundamental role they play in our psychic lives and how they unite productively the fields of aesthetics, literature, and psychoanalysis. 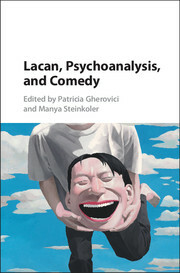 “Lacan, Psychoanalysis, and Comedy” (Cambridge University Press, 2016), the second collaboration between Patricia Gherovici and Manya Steinkoler, features essays by Geoff Boucher, Simon Critchley, Marcel Drach, Patricia Gherovici, Sigi Jöttkandt, Dany Nobus, Carol Owens, Jean Michel Rabaté, Molly A. Rothenberg, Matthew Sharpe, Manya Steinkoler, Jamieson Webster, and Alenka Zupančič, exploring laughter, humor, and the comic from a psychoanalytic perspective.